If you’re a serious PC gamer, you’re going to need a suitable PC desk. That doesn’t mean one that’s covered in LED lights – just one that’s large enough for your monitor, but more importantly, one that’s comfortable and sits at the right height. With so many desks available, it can be hard to find the right one. You don’t have to worry, though, as we have done the research for you and found some of the best gaming desks to buy in 2019! 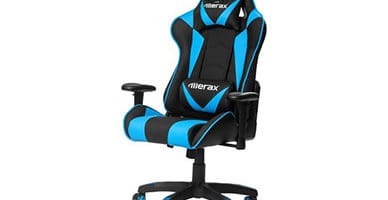 Before we continue, remember to check out our guide on the best gaming chairs you can combine with your new computer desk! If you’re serious about your health, you seriously need a good and ergonomic office or gaming chair. PC gaming is on the rise, but there’s more to it than just building a powerful computer. So what else is there? Well, if you’re like most people, you probably think that desks are fairly straightforward. After all, it’s just something that holds your monitor up, right? Not exactly. There are all sorts of ways in which a bad desk can cause problems. Once you actually start using a desk, it quickly becomes clear whether it’s any good or not, but by then it’s usually too late. To help you choose a gaming desk that’s right for you, we’ve created a short buyer’s guide that explains what to look out for before spending any of your hard-earned cash. This is a term that’s often thrown around, but not everybody knows what it actually means. 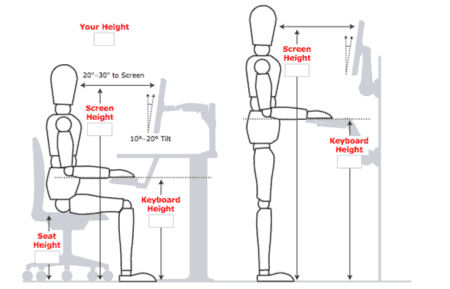 So what are ergonomics, and why should you care? Simply, a desk’s ergonomics refers to how it feels to use. For instance, if the desk is really tall, you’ll need a chair that can go even higher or else you’ll be at risk of a repetitive strain injury when typing for long periods of time. To help prevent this, some computer desks come with a retractable keyboard tray. This allows you to vary the distance from the keyboard based on the rest of your setup, and can really help reduce wrist strain. Basically, you just have to ensure that the desk is tall enough, without being enormous. You may also want to consider buying a chair with a variable height since this will give you some leeway. How much room do you actually have? 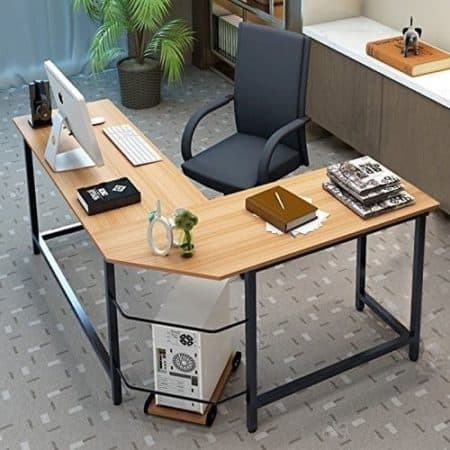 Desks come in all shapes and sizes, so while you might like the idea of a huge executive desk, it may not be practical. If you’re short on space, you might want to consider a wall-mounted foldaway desk (for laptop users) or an L-shaped corner desk. These allow you to have all the space you need without taking up the entirety of a wall. You know yourself better than anyone, and believe it or not, that actually factors into which desk is best. Are you kind of messy when you work or are you super-organized? Neat freaks will find that a desk with one or more drawers, and perhaps even a backboard will suit them perfectly. For these people, a desk designed for a computer is ideal. 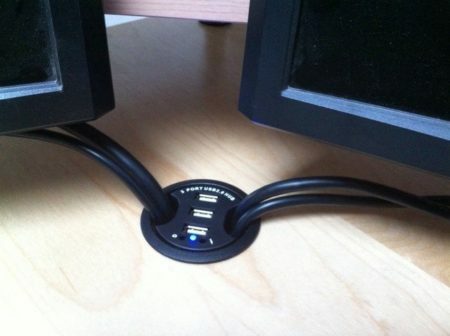 Some have holes to facilitate cable management, and these are an often underrated way to keep your workspace tidy. On the other hand, if you like to spread papers everywhere, you might prefer a simpler desk: one that’s large enough to give you all the surface area you need. Appearance is arguably one of the most important features of a desk. An attractive desk can be the difference between a really productive day and eight hours of procrastination, so appearance really matters. 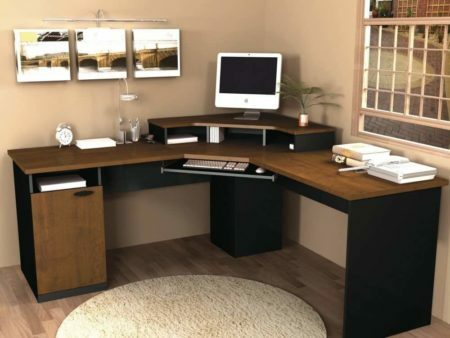 Of course, you’ll want to purchase a desk that complements your décor, and luckily, they come in all different styles: wooden, metallic, glass, and so on. If you find a desk you like, but it’s a little plain, don’t worry: you can always paper the work surface to give it a little extra personality. Another important consideration is where your computer will sit; if it’s under the desk, it can restrict leg movement and reduce your tower’s cooling capacity, so if possible, try to leave some space for it beside your desk. Look, we get it. You’ve spent most of your budget on a graphics card and now there isn’t much left for the desk. Nightmare, right? Actually, it’s not as much of a problem as you might think. There are loads of high-quality desks available that won’t break the bank. The hard part is separating those that are merely very good from the ones that are excellent. Luckily, we’ve done it so you don’t have to. 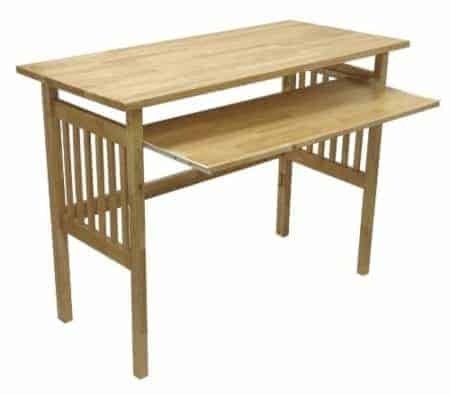 After thoroughly researching the market, we’ve found four fantastic desks that are available for less than $200. First up, we have the Z-Line Belaire. 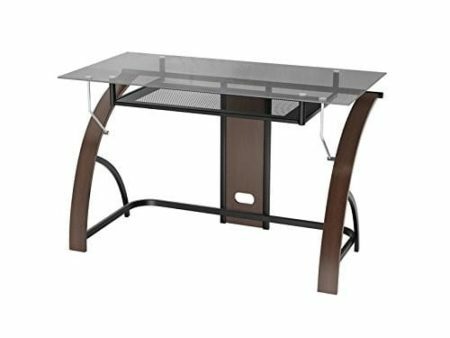 This is a sleek, premium looking desk with glass surfaces and a classy metal frame. You’re probably already worried. Glass? What if it breaks? Well, the Belaire uses tempered glass, so it’s tougher than most. Tempered glass shatters into large chunks too, so it’s actually far less likely to hurt you. On top of this, if the glass breaks, you can make use of Z-Line’s lifetime warranty. They’ll replace it for free, as long as you didn’t cause the breakage. This desk is 60” tall, 24” deep, and 37” tall, yet weighs just 96 pounds. There’s a slide-out keyboard tray, and it’s L-shaped, making it perfect for people with multiple monitors. So what’s the catch? As far as we can tell, there isn’t one. The Z-Line Belaire is a great choice for gamers – it looks great, is large, and comes with an attractive price tag. Next up, let’s take a look at the Techni Mobili Deluxe. Despite its fancy name, this desk only costs around $180. This is another corner desk with a tempered glass workspace. It’s a little larger than the Belaire, at 65x65x30”, and the metal frame is not only scratch and moisture-resistant, but reinforced too. One of the best things about this desk is its customizability. 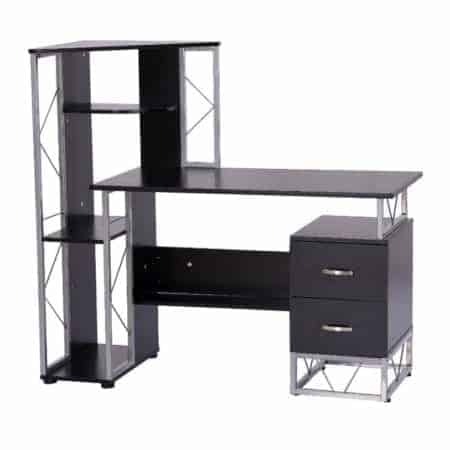 It can be assembled with the keyboard tray on either the left or the right side, or even used as two standalone desks. There are two holes on each side of the desk for easier cable management, and because it’s not closed at the back it doesn’t interfere with your computer tower’s airflow. As far as appearance goes, the Mobili Deluxe is nice, if a little plain. We’d have preferred to see an all black or all silver color scheme instead of the black, silver, and glass theme that they went for. Ultimately, though, this is just our opinion and has no bearing on the quality of the desk itself. Our third budget desk is another offering from Z-Line, this time, the Claremont. This is a desk that just screams “high quality”. It has a black metal frame with a real wood veneer finish on the front legs. 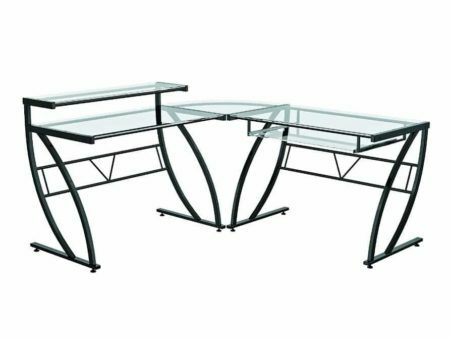 The desktop is made from smoked safety glass and actually complements the overall appearance very nicely indeed. This is a slightly smaller desk than the others we’ve seen. It’s 24” deep, 47” wide, and 30” tall, and has a price tag of around $125. So what else is there? Well, the keyboard tray can be pulled out, and there’s even a single cable management port at the rear of the unit. After all, nobody wants to ruin a gorgeous desk with a messy pile of cables. This desk would look great in a bright, modern room and almost looks like it was designed to be used with a Mac of some kind. It’s just that expensive looking. The last of our budget picks is the Gaming Desk by Atlantic. This is a desk designed with the messiest of users in mind, and it shows. It’s simply covered in hooks, racks, and stands. Put it this way: it has its own drinks holder. There’s also a removable screen stand, speaker holder, and CD rack. Now, this does negatively impact the desk’s appearance a bit. It’s very simple looking, with a wireframe design and metallic desktop. This isn’t a huge deal, but it does go some way towards explaining the low price point. Unfortunately, there’s no keyboard tray and this desk only supports monitors of up to 27”. This means that this desk is less comfortable to use for extended periods of time and additional care has to be taken in order to prevent repetitive strain injuries. Despite this, it’s a great desk for laptop users or people who like to remain as organized as possible. Maybe you have a little more room in your budget and you don’t mind spending a bit more money to find something exceptional. If this sounds like you, you’re in for a treat. 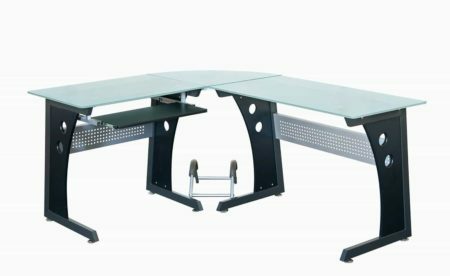 We’ve found three excellent gaming desks that we think would make fantastic additions to your games room. So let’s get to it! The first of these is the Bestar Hampton. This comes in wood or granite-style variants and costs a little under $380. So what makes this a great desk? Well, for a start, there’s a lot of space. 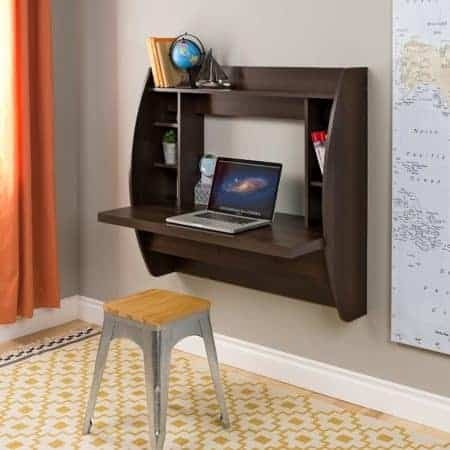 It’s a corner desk that comes equipped with several shelves and its own cabinet. With a width of 70”, you’ll have all the room you need to stretch out. In fact, there are several small touches that give this desk a feeling of luxury. Let’s take a look at some of them. The work surface is coated with PVC to improve its shock resistance, and the keyboard tray uses ball bearings to help it slide out almost silently. In our opinion, the brown variant looks better; simply, the granite appearance is more reminiscent of a kitchen counter than a gaming battle station and makes it look a little out of place. Don’t get us wrong, this is a fantastic desk, but this was a strange design decision. 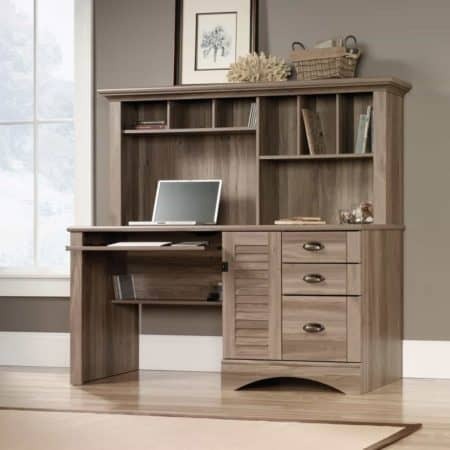 If you’re looking for a desk that’s as luxurious as it is functional, look no further than the Sauder 415109. This salt oak finished desk comes with three drawers, a cupboard, and six shelves, so it’s not exactly short on storage space. The only issue with this desk is that it doesn’t leave much space for your legs. If you’re the kind of person who finds themselves playing around on a swivel chair, that’s a habit you’ll have to get rid of. Now, we know what you’re thinking. This desk looks like a pain to build. It’s actually pretty easy, though because it comes with a slide on moldings. 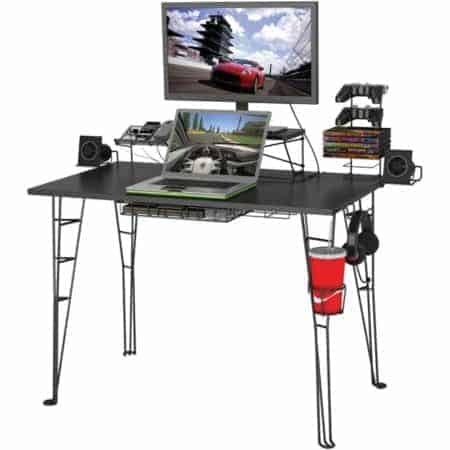 Even though this desk wouldn’t look out of place in a home office, it’s also pretty great for gaming. This is because it has a place for all your peripherals: there’s enough space for all your controllers, hard drives, and cables. Plus, because it has a solid construction, you can hide all the cables behind the desk itself. Finally, we have the Tribesigns desk. This one actually looks a lot more expensive than its sub-$150 price tag would suggest. Now, this is more of a general purpose desk and it doesn’t come with a keyboard tray. However, it’s still good for gaming, and we’ll tell you why. At just 23.6” wide, this desk leaves very little room for clutter. This means that when you’re reaching for the mouse at a crucial moment, you’re not going to accidentally knock anything over, costing you the game. The two drawers are very spacious, at almost 3” deep. 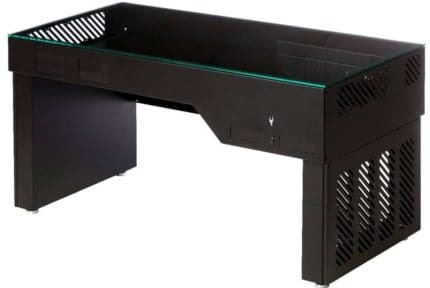 This lets you keep all of your gaming accessories in one place for easier access, and thanks to the steel frame, the desk won’t buckle no matter how much you put in them. In short, this desk has a deceptively simple appearance. Look past its plain design and you’ll find a surprisingly solid gaming desk with very few flaws. Let’s say you want a gaming desk that accentuates the room around you. You probably think of a big, fancy executive desk, right? The truth is that there are several very attractive desks available, and they aren’t all as expensive (or imposing) as a huge, lawyer-style desk. We’ve rounded up three of these gorgeous products, and best of all, they all cost less than $220. We’ll begin by looking at the Sauder August Hill. This is an L-shaped, oak finished desk that has enough space for all your gaming needs. You don’t have to worry about damaging the wood, either, because the top is finished off with dark slate. This increases the strength of the unit while preventing you from cracking or chipping the work surface as easily. But that’s not all. The August Hill is almost 60” wide once assembled, so you can stretch out, plus you could even place several games consoles on the integrated shelving if you liked. Although this desk is just under 30” deep, there are cutaways to give you some extra leg room. For this reason, this desk is best suited a few inches away from a wall or facing the room itself. Our next pick is slightly unconventional, but if you game primarily on a laptop or are short on floor space, it’ll be a very attractive proposition. The Prepac Desk is wall-mounted and comes in three different wooden finishes. It has built-in cable management which helps maintain the very clean appearance of the unit. So what makes this good for gaming? There are shelves on either side of the unit. 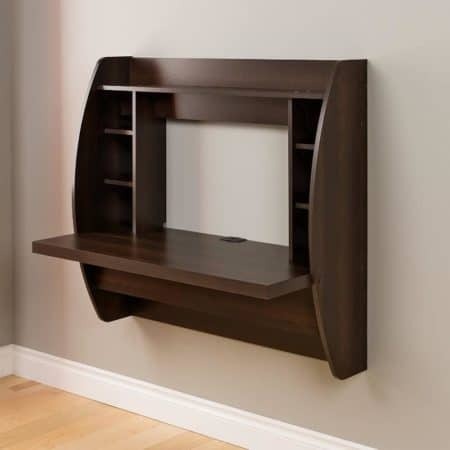 These each has a removable piece of wood that allows you to enlarge the shelves – perfect for larger speakers. Considering laptops don’t usually have booming audio, this can really enhance your gaming experience. Now, due to its small size and lack of retractable keyboard tray, we can’t recommend it for tower PC users. That said, the Prepac is a stylish and affordable gaming desk for people who want great aesthetics on a budget. The minimalist look has been big recently, and it can be hard to find a desk that complements the rest of your décor. Enter the Coaster 800520. 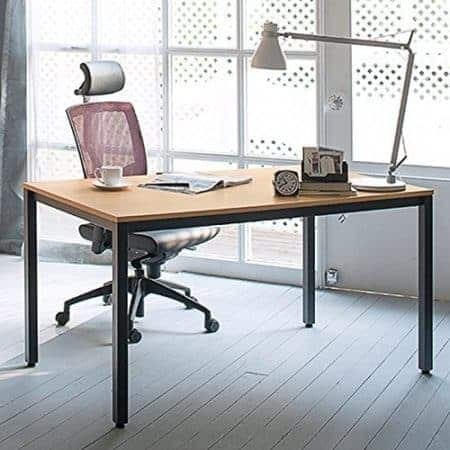 This desk has a simple metal and wood design and comes with three good-sized drawers that allow you to store everything you need without cluttering up the desk itself. So how does it hold up? This desk has a very open construction. With no backboard, lots of wires can quickly make this desk look untidy, but at least there’s plenty of room for a computer tower and of course, your legs. This model is pretty large at 57”, pretty surprising considering it costs less than $160. What’s more, you can switch the drawers over to the left-hand side if you’re left-handed. There’s a lot to like about the 800520. Although it’s tailored more towards laptop users, it’s perfectly capable of being used for a proper gaming PC as long as you don’t mind seeing wires at the rear. Hey, we get it. After years of gaming, you’ve accumulated tons of peripherals, controllers, and cables, and now you need a desk that can store them all. No problem. We’ve found three desks that emphasize their storage space above all else while remaining solid choices for gamers. Without further ado, let’s take a look at them. 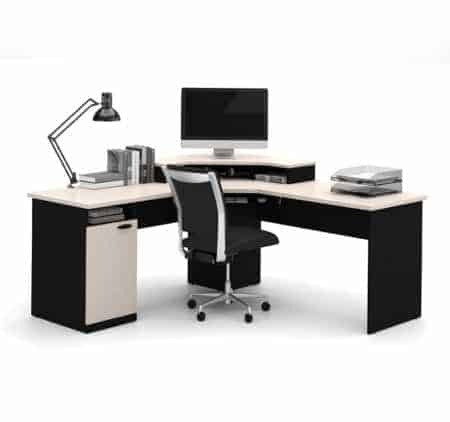 We’ll start with the HomCom Office Workstation. This desk is 52” wide, has two drawers and includes what is essentially a shelving unit on the side. 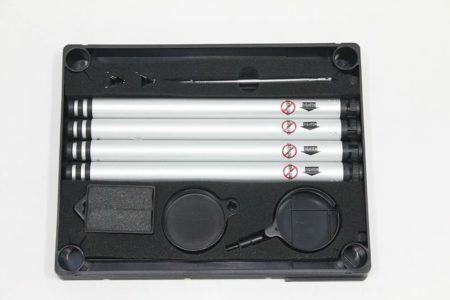 It comes in either black or white variant and has a very open design, so while it’s great for organizing things, it can look a little cluttered if you don’t spend some time tidying it every once in a while. The only real issue with this desk is that it’s a little strange to look at. The shelving extends over the lip of the desk a bit, as do the drawers so it can be hard to feel “centered”. If you don’t mind this, though, the HomCom will make a great addition to your games room, in no small part due to its size, interesting design, and massive storage potential. Next, we have a desk from Convenience Concepts. It’s flashy looking, with a metal and wood aesthetic that never grows old. This is another open desk, so it’s not great as far as clutter is concerned, although it makes collections of books or disks look highly refined. 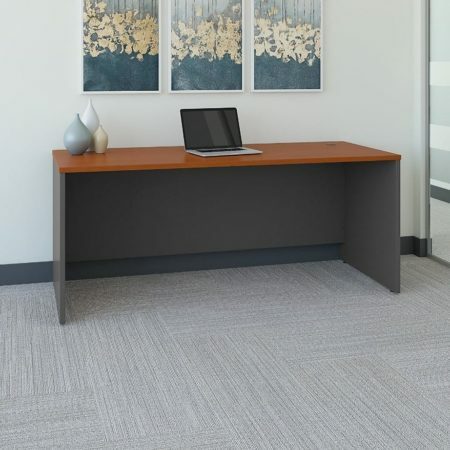 This desk comes in four colors and can be assembled without any tools, making it a great, low-cost solution. The lack of a keyboard tray is a slight disadvantage, but for laptops, it’s perfect. At 50” wide, this is a decently sized offering, and we really liked the little shelf underneath the desktop itself. This is recessed and basically doubles the amount of space that the desk offers. Here’s the thing: at 44 pounds, it’s not incredibly heavy. Considering the narrow feet, you’re more than likely to see a little movement if placed on a carpet or other soft furnishings. Last but not least, let’s take a look at the Bush Furniture Cabot. The Cabot is a monster of a desk – it fits into a corner and comes with two drawers, two cupboards, and a massive eight shelves. As you might expect, it’s pretty heavy. The whole desk weighs over 200 pounds and measures more than 60” wide. It also includes a 4-device USB hub so you can charge your spare controllers as you play. Now don’t get us wrong: this isn’t solely for gaming. It has a high price tag and takes up way too much room. On the other hand, if you already have a home office, but also want a desk for gaming, the Cabot is an excellent choice. The ample storage allows you to transform it from a workstation to a gaming desk in a matter of seconds – just put the work stuff away and pull out the consoles. Look, we know that gaming is seen as a solitary hobby, but there are going to be times when you want to set up a LAN party or something similar. 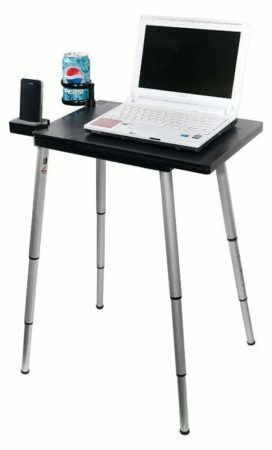 For these occasions, you’ll need a portable desk that you can set up quickly. No problem! We’ve found a trio of exceptional desks that are not only compact but wallet-friendly, too. The first of our recommendations is the FlexStand desk. This is designed for laptops, and actually, includes two base-mounted fans to help keep your machine cool. That’s not all! 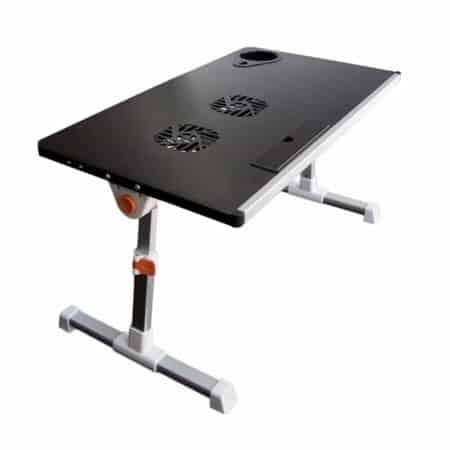 The table surface can be tilted by up to 45° to accommodate tablets and hybrid laptops. There’s even a cup holder for extended sessions. 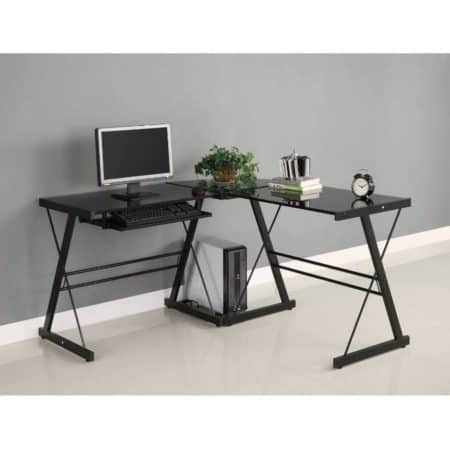 This desk has adjustable metal legs and a maximum height of just a foot tall. This makes it unsuitable for use as an everyday desk, but it’s fine for occasional usage. 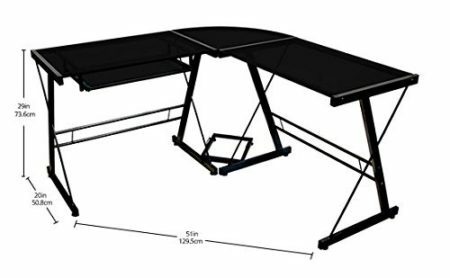 These legs fold inwards for easier portability and storage, and since the table is just 20” wide, it’s not too hard to find a place to put it when not in use. One of the best things about this model is its very low price. It retails for less than $40, which is fantastic considering you’ll likely only use it from time to time. Next, we have the Tabletote computer stand. 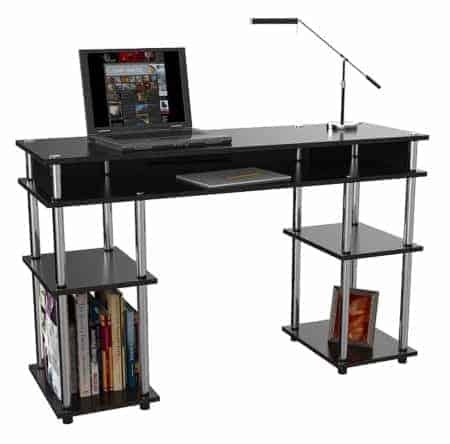 This is an absolutely tiny little desk but its workspace can expand to up to 22” in width. The whole unit weighs less than three pounds and its adjustable legs can reach up to 29” in height, so it’s highly versatile. So what’s the catch? Well, since the legs are a little thin, this desk can’t support a whole lot of weight. Don’t get us wrong, it’ll hold a laptop and some other things just fine, but don’t expect to load it with 20lb of stuff. Setting this table is up really easy. It’s just a case of slotting the legs into the recessions on the underside. The whole process takes just a few seconds and really couldn’t be simpler. If you’re looking for the most portable, lightweight gaming desk around, the Tabletote is it, no doubt about it. Lastly, we have the Winsome foldable desk. Now, this product is a little heavier than the others we’ve seen, but it’s equally portable thanks to its fold-down construction. So how big is this desk? This is a 40” wide desk that comes with its own keyboard tray. Because it’s made of beechwood, it’s more stable and solid than its lower cost rivals, and we think this also gives the Winsome the edge aesthetically too. Obviously, wooden desks are more expensive than plastic ones. As such, this desk comes with a price of around $80. Despite this, we still believe this price is justified: where else can you find a full-sized, foldable desk that looks great? Even though it weighs 30lb, this still isn’t heavy enough to pose any real problems. This is more intended for people who want a dedicated gaming area but don’t really have space for one. PC gamers are known for their high-end machines, and they often have more than one monitor. To accommodate this, you’ll need a wide desk. Not to worry though: we’ve found four excellent desks that are more than capable of holding several monitors at the same time with no need for a fancy screen bracket. First up, we have an L-shaped desk from Tribesigns. This desk offers two workspaces and over 90” of desktop, so there’s plenty of room for up to three monitors. Sounds good, right? Well, there’s more. 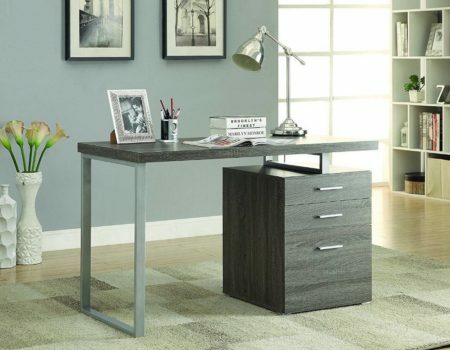 The open design of this desk lends itself to those who like a little extra leg room. It even comes with a raised platform to put your computer tower on, so you don’t have to worry about airflow. Despite its slim metal legs, this is a very sturdy unit. It can support up to 450lb of weight and comes with an 18-month limited warranty so even if it breaks, you can have it replaced for free. 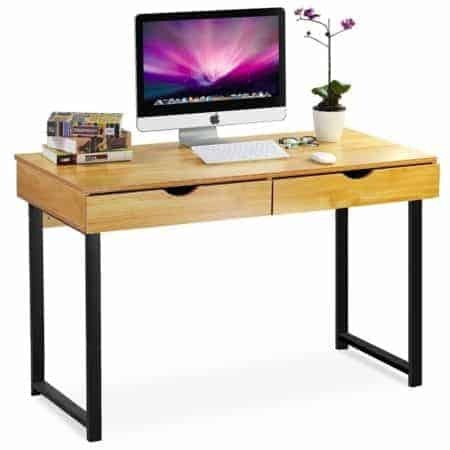 If you’re not a fan of the teak wood design, you can also get a black variant, although we think that this makes less of an impressive and makes the desk look a little imposing. Next, let’s examine the Walker Edison Soreno. 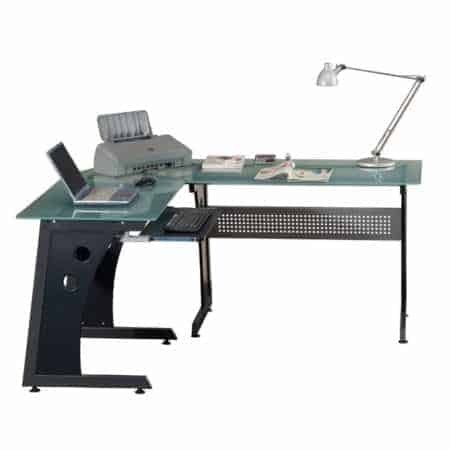 This is another L-shaped desk, although it’s made of metal and glass, instead of wood. We really like that this is a smaller desk – this means that the monitors will be closer together because there isn’t such a sharp angle between the two sides, you can have three of them closely grouped. Unlike the Tribesigns desk, this one comes with a keyboard tray that can be attached to whichever side you prefer. This won’t mean much if you use a controller, but for keyboard and mouse gamers, it offers an extra degree of customization. The space below the desk is nice and clear, and even when your computer is placed on the tower stand, there’s a lot of leg room. This is not only good for ergonomics but stops the desk from looking bigger than it actually is. So this desk is perfect, right? Almost. The only issue we found with this model is that it’s heavier than it looks, at 57lb. This is in part due to the tempered glass panels, but at the very least, you know you’re unlikely to tip it over. The Need desk is a very wide product at 55”, but if that isn’t enough, there’s also a 63” variant. Let’s be honest for a second: this is not a fancy desk. It is, however, large enough to fit several monitors on. It has a very simple design – it’s essentially just a very long table. It doesn’t come with a keyboard tray, but because the underside is entirely open, there’s more than enough room for your computer tower and legs. Let’s talk aesthetics: how does it look and is it going to get damaged easily? This desk comes in six different colors. This will allow you to better match it to your existing décor – it’s a small touch, but one that we think is important. The wooden desktop is coated with a glossy, anti-scratch finish. This is a must, and really extends the life of the product. 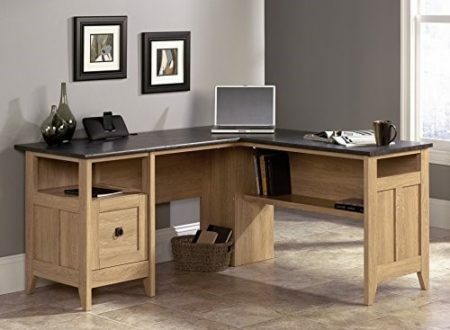 In short, the Need desk is hardy and solidly built, with all the space you’ll ever need. Finally, let’s take a look at the Series C desk. This is by far the largest desk we’ve seen: so large in fact that two people could use it with room left over. It’s 72” wide and comes in six different finishes. It’s a little plain looking, but the simple construction makes it easy to build. There’s a small gap at the rear. This gives you a little extra legroom but also helps you to keep your cables neat and tidy, regardless of how many there are. Essentially, this is a desk for people with a serious computer setup. It has space for three monitors, looks great and best of all, it costs less than $250. If you’ve struggled to find a desk that can rise to the challenge of your gaming needs, the Series C would be a great choice.